One of the things I enjoy doing on Sunday (or early Monday morning like 1am) is visiting the PostSecret website and looking through the secrets chosen for the week. This has been my weekly routine ever since I met her and realise that she loves PostSecret too. Maybe it’s because I tried sending a secret in for her too (via a very expensive express post) and it didn’t get picked. Bummer. So I’m secretly hoping it will appear one day? Sometimes I laugh, sometimes I get a little sad, and sometimes I can relate to them… Like the secrets posted on 26 August 2012… There were two that immediately stood out for me tonight. 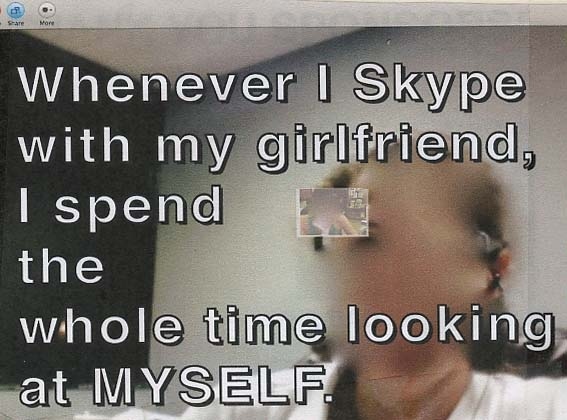 Hahaha, I remember the times when we Skyped and all we could keep looking at was ourselves on screen and admiring how we looked. I miss those times when we Skyped all the time, have our meals together, go to bed together, share our day together, watch TV together, check out each other’s outfit for the day. I miss how you’d Skype me the minute you reach your hotel room. I’d be at work in the mornings and you’d be disturbing me, trying to make me laugh out loud. And I’d spend my lunch hour talking to you until you got changed and ready to nap after your long flight. Or I’d rush home after work so I could talk to you when you come back from shopping, have your dinner and go to bed. All those late nights and long conversations. Good times. The truth is I could spend all day looking at you and I’d be content.